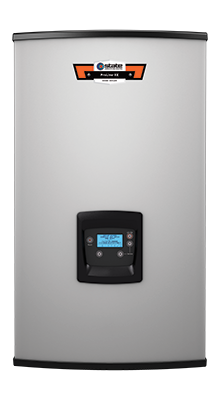 The ProLine® XE Combi Boiler provides high efficiency space heating and domestic hot water (DHW) in a compact footprint that is easy to install and maintain. The efficiency of the combi is rated at 95% AFUE (Annual Fuel Utilization Efficiency) making it available on many utility rebate programs. Lastly, the plain text Setup Wizard on the Smart Control LCD display will make installation a breeze. The SCB-110S-P indoor residential Ultra-Low NOx Combi Boiler uses up to 110,000 BTU/hr of Liquid Propane to deliver a continuous supply of hot water and space heating for a home. This High Efficiency heating system has a 95% AFUE and is ENERGY STAR Certified. User-friendly LCD display provides system status and diagnostic information in plain text. The Set-Up Wizard display makes it simple to set system parameters in just minutes. Direct venting up to 100 feet using either PVC, CPVC, polypropylene or AL29-4C stainless steel vent pipe, allows for flexibility and easy installation. The innovative fire tube design can produce a higher heat transfer coefficient than traditional fire tubes. Reliable hot water supply to provide hydronic heat for the entire house in addition to supplying enough domestic hot water for a single family home or apartment.